How is that for a snazzy title? I saw these pillows in Ballard Designs and thought they were dreamy. They have a dreamy little price tag to go with them. Anyone have an extra $75 burning in your wallet, ready to be dropped on ONE pillow? I didn’t think so. Me neither. So I improvised. I wanted pillows for my porch to tie things together, but (shocker) I didn’t want to spend any money on them. So this is what I came up with. I had an old chair cushion in the linen closet. I rolled it up and used the chair ties to secure it. Wa-la. A bolster pillow. Okay, so it didn’t look that great and Hubby gave me the look he gives when he’s trying not to hurt my feelings. It wasn’t really working, but you have to give me points for creativity at least! Notice the table too. Because that’s about to get a makeover. Check out those cute pillows and look at my shiny “new” table! Oh, Ode to you black spray paint. Okay, so now let’s look at those pillows up close. Let’s start with this sweet little pillow below, Butterfly No. 4. Can you see all 4 butterflies? The only thing sewn on this pillow are the buttons. I left the top part open, so it’s like a little pocket. The H pillow was fun to make and probably the easiest. Does anyone recognize the fringe at the bottom of the pillow? Remember when I was making my pinboard and I told you I’d save it for another project? I had no idea at the time it would soon be adorning my cute monogrammed pillow. It looks great recycled here. Okay, so how did I do it? I took some of my Big-Lots $4 drop-cloth material (I have sooooo much left!) coupled with bits and pieces of ribbon, fabric, buttons, hem-tape, fabric glue, and old pillow forms that I already had on hand. Tip: If you don’t have pillow forms go to Goodwill and buy some ugly pillows, take off the ugly covers, wash them, and ta-da–pillow forms. I bought a pack of Avery T-shirt transfers for $7 at Walmart. (These were the most expensive part of the project. Also, if you don’t already have the other supplies on hand, the cost could add up as well.) I designed my pillows on Scrapblog.com and exported the pics as jpeg’s into Word. I printed them onto the transfers. Cut and “stitch-witcheried” my pillows, finished them off with fabric glue, and glued on all the bling. They have already withstood two little boys pulling at them and supposedly they can be washed, although, I’m not sure they’ll withstand that. We’ll see. If you decide to make your own, please link back to me and show off your finished project. Also, that was probably the worst tutorial ever given, so if you have questions, I’ll be happy to answer them! (Sisters, if you like any of the pillows you can place your Christmas order with me now :). Hi Sharon! It won’t run through the washer well but general everyday use should be okay as long as the transfer doesn’t have any lifted corners. Those are awesome pillows. I really like your website for ideas. Thanks so much Debbie :). They're all gorgeous, but I LOVE the French bee number pillow. Do you happen to know the name of that font? Stephanie, I found the "H" at scrapblog.com. Thanks so much for stopping by! And I forgot to have the comments emailed to me…so here I am again! Just found your blog – such cute pillows, but where did you find your H monogram? I've been looking online for weeks for a monogram that I liked…. I am including your link to a dropcloth inspiration blogpost at http://www.greengraciehome.blogspot.com. Thanks for the creativity! I am trying to copy at this very momment but the French Bee appears to be gone… (sniff, sniff). Does anyone know where I might find it on the web? Great pillows, btw! Pure genius!! I've been dying to try these. Your's are darling. Can you tell me a little about scrapblog? Please. I'm I love with all your projects to be honest. They are fresh ideas. Wo. man. Where do you get the energy? For real. Those are amazing. You are amazing. And you really got me with the run pillows joke. Hilarious. what is "stitch witchery"? Sounds like something i need to know more about. 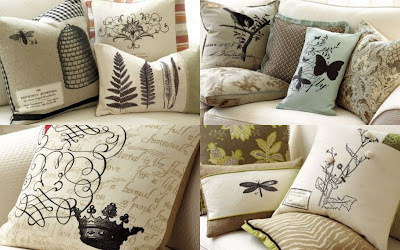 Those cushions are gorgeous – very hard to pick a favorite! #1. I am so madly in love with those pillows! Every picture, I kept saying, "Oh my gosh! Oh my gosh!" #2. Yes, that is perhaps the worst tutorial ever. You lost me at "I bought…" Either FB me or do a whole other post on this, 'cause it's totally worthy of one! They're just adorable, Beth!